In addition to its imaging, the SonoSite MicroMaxx Vet ultrasound is highly durable and portable, a smart choice for everything from small house pets to the biggest farm animals. 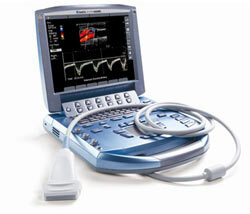 SonoSite ultrasound machines are durable, rock-solid and easy to use. The refurbished MicroMaxx provides vets with an affordable shared-service veterinary ultrasound with legendary durability as well as very good image quality. The SonoSite MicroMaxx vet ultrasound for sale has a great price for a used portable ultrasound that offers all the things a vet is looking for in an ultrasound… easy-to-use, durability, image quality, battery powered, and probes appropriate for the veterinary practice.